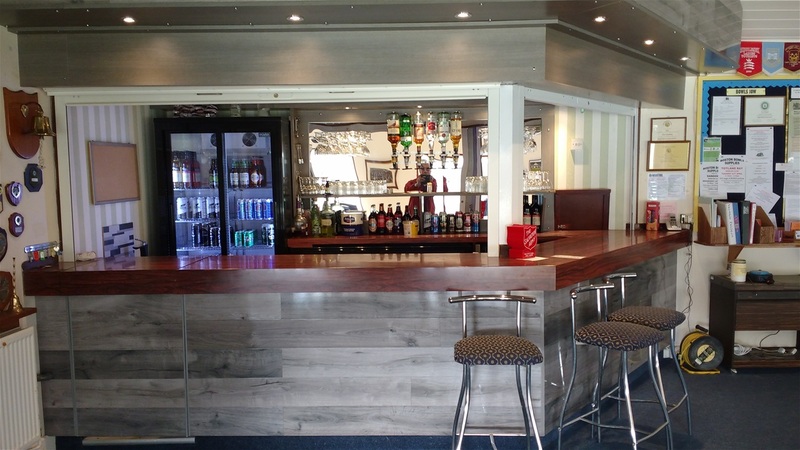 During the last few months the bar has undergone a complete internal re-design and an external face-lift. ot starting until after Christmas, Derek Venier and Roger Smith have dedicated hours of their own time to upgrade the Bar and bring it into the 21st century. It has been completely re-designed on the inside to give more room for the bar staff and now has two new cooler cabinets, providing nearly four times the number of cold shelves than were there before. All-new LED lighting, both on the inside and the outside, enables the new bar to be seen in all its glory. Everyone at the Club is in Derek’s and Roger’s debt for their fantastic effort, giving us a bar to be proud of. 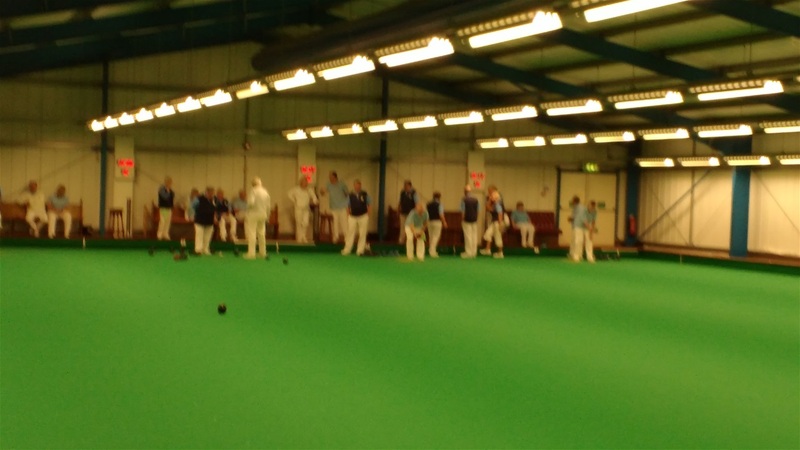 A mixed team of sixteen from Ventnor played a representative team from the host club in their excellent indoor facility at Cowes. he Ventnor players made a slow start and, despite the practice session before the start of the match, the experience of the home team, playing on their own familiar carpet, began to show through. At the half-way stage, of the 18 ends, things did not look good for Ventnor who were losing heavily on all 4 rinks (19-53). After a short break for tea and biscuits, the visitors staged a remarkable come-back, reducing the deficit to just 8 shots, with wins on two of the four rinks! If we had played the full 21 ends who knows what might have happened?? This is the second year we have played this event and an amazing result, since we were comprehensively thrashed last year. Arrangements at our end were made by Club Captain, Liz Pearce. FOR THE SIXTH YEAR RUNNING, TWENTY-FOUR VENTNOR BOWLERS TRAVELLED TO WESTRIDGE TO PLAY THE ANNUAL INDOOR MATCH AGAINST THE ISLE OF WIGHT INDOOR BOWLS CLUB AT THEIR SUPERB INDOOR FACILITY. Even though we have now got used to our new carpet at Ventnor, the speed of their carpet is still much greater, and consequently still takes a while to get accustomed to. As can be seen from the picture of the final scoreboard (above), we did not win…………..(surprise, surprise!). The winning margin for the hosts this year was 62 shots, which is not our best “defeat”, but by no means our worst! (in previous years the winning margins have been 66, 97, 100, 72 and 35 - an average of 74). 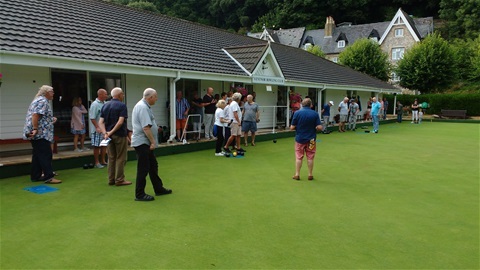 This year, Ventnor again won on two of the six rinks, with John Walker and Barry Dominey being the victorious skips. After the game, all the players and guests enjoyed the usual two-course roast dinner during which the Ventnor President, Elsie Booth, thanked the IWIBC Captain-of-the-day, Annie Morris, for the hospitality and welcome that we were given. We are all grateful to our Club Captain, Liz Pierce for making the arrangements at our end for what turned out to be another “interesting” and enjoyable afternoon. Some of the players "warming up". AFTER SEVERAL YEARS of friendly rivalry on the cricket field at Steephill, Ventnor Bowling Club was pleased to welcome these two local pub sides to Mitchell Avenue, for an evening of a more sedate and less-strenuous sport! The fierce competition was still the same, only the name of the game had changed, and being a mixed sport, the ladies were able to join in as well as the men. We were lucky with the weather as the threatening dark clouds and the distant rumbles of thunder stayed away, and we were able to complete the scheduled sixteen ends in the dry. 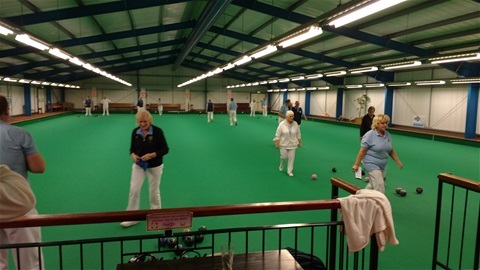 The format was teams of four made up of three members from each pub and one member of the bowling club to give guidance when needed. With SIX rinks in use, this meant that a total of 48 players were on the green at the same time. The scores on five of the six rinks were close, with no more than three shots between the sides, but one rink bucked the trend by winning by 9 shots! This was the top rink for “Perks” consisting of Steve, Al, Jan and Sid Lines (Bowling Club), who won 17-8. Top rink for the Crab & Lobster was Don, Betty, Dave and Richard Wyatt (from the Club), with a score of 18-15. The overall match result was Perks 81 shots and Crab & Lobster 75 shots – well done everyone who took part. After (and during!) the game most players (as you would expect) took advantage of the bar facilities. A raffle, which raised £100 for P.A.T.C.H., was run by Susan Heaton-Watts and the whole evening was brilliantly organised by Club Captain – John Milmoe. The opening of the Green, delayed by six days due to the recent poor weather, took place last SATURDAY, April 21st, at Mitchell Avenue. One of the Club’s most stalwart members, Roy Dicker, died just before Christmas and we were privileged to have his widow, Heather, perform the opening ceremony. Heather thanked the Club for inviting her and wished everyone a successful season. She then presented the Club with a bench engraved “In Memory of Roy Dicker 1936 - 2017”. President Derek Venier thanked Heather for graciously accepting our invitation and presented her with a commemorative photograph of the Club to mark the occasion. ver sixty members were in attendance, with 48 taking part in a spoon drive, which was won by Richard Wyatt (again!) by the narrowest of margins. Roger Smith was the runner-up one point behind. The “Spider”, for a bottle of whiskey was won by John Wright. President Derek thanked all those who had made the day a success especially those who had provided and prepared the food. He also welcomed new members, Moira Steven, John Lindsay & Ian York and thanked all those whose hard work had ensured that the clubhouse and surroundings were in pristine condition - as it always is for opening day. A mixed team of sixteen from Ventnor played a representative team from the host club on their superb indoor rink. The Ventnor players made a confident start but the experience of the home team, playing on their own familiar carpet, began to show through. 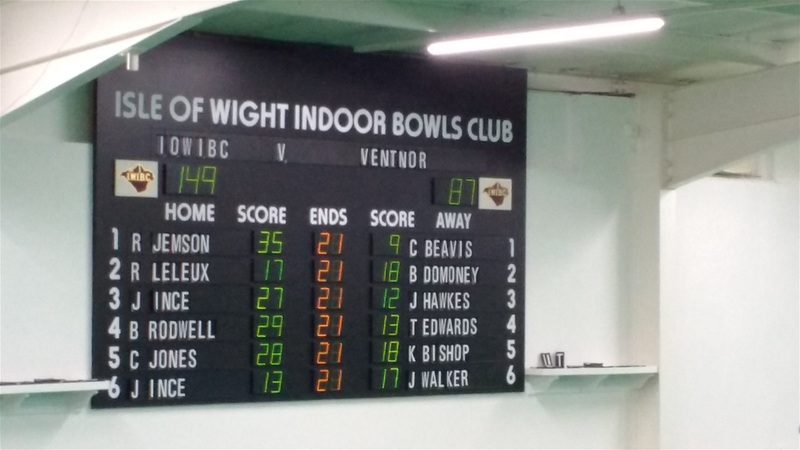 At about one third of the way through the twenty-one ends, Ventnor were holding their own on three of the four rinks, and were, in fact, leading on two of them! In the end we were well beaten on rinks one, three and four - only rink two (Rose Holmes, Angela West, Colin Beavis & John Walker) managing a draw (17-17). As I’ve said when we play our annual indoor match at Ryde, the score is unimportant (especially when you don’t win!) but the experience gained from playing on a different carpet is invaluable to us all. The afternoon was hosted by ex-Ventnor player, Barry Bridgeman, and Roger Payne, the home club men’s captain. The arrangements for Ventnor Bowling Club were ably handled by Club Captain, John Milmoe. It was suggested after the game that the event become an annual fixture. Roy was a former President and Club Captain but, most importantly of all, he was a friend to all bowlers who had the pleasure of playing with him and against him. 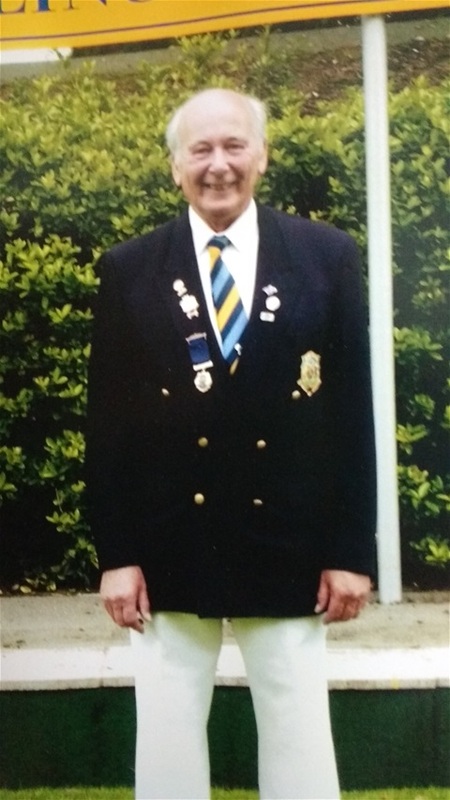 He devoted a substantial part of his life to Ventnor Bowling Club and he will be sorely missed at Mitchell Avenue, and around the Island. The funeral will be held on Friday, January 19th at the Isle of Wight Crematorium at 12 o’clock for family and close friends, followed by a memorial service at St. Catherine’s Church at 2.30pm. Heather would like to invite everyone to the Bowling Club after the service, for food and drinks. President, Derek Venier welcomed fifty members, family and friends to a superb roast dinner last Sunday afternoon, excellently prepared and cooked (as usual) by Catering Manager, Carol Venier, ably assisted (as usual) by the ladies of the Club. Derek also welcomed special guests Christine & Graham Benson, our near-neighbours in Macrocarpa Road, who “popped over” for the afternoon. Graham’s late father was a bowler, and upon the recent death of his mother, decided to donate his bowls to our Club, along with a framed water colour of a bowling match in progress. The afternoon concluded with the Grand Draw for the Christmas Hamper, which was won this year by Club Vice-President Elsie Booth. Second Prize, a mini hamper was won by Colin Beavis and the other winners were Judy Anderson, Barry Domoney and Sheila Arnott. Video of Ventnor and the Bowling Club taken from the air. This video of the Club and the surrounding parts of the town were taken with a drone, and very kindly donated and added to our website by 15-year old Ethan Wilson - Keith Bishop's grandson. 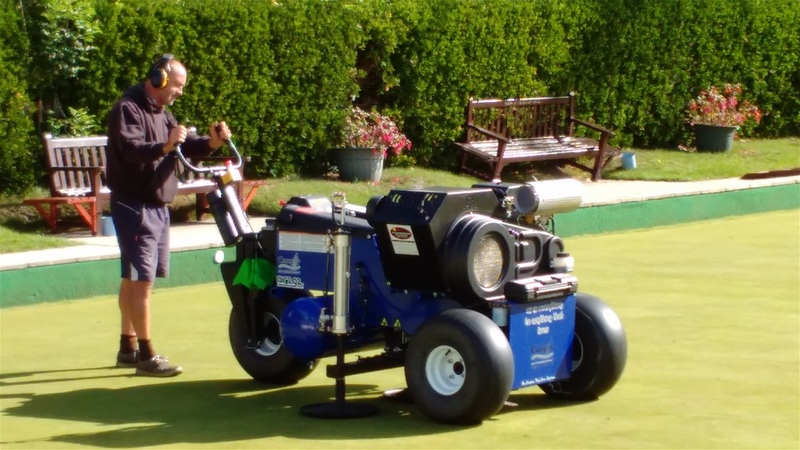 Andy Butler operating the "air2g2 Terrain Aerator"
Our playing surface is, and has been for a long time, one of the best on the Island. However the problem with any fine grass surface is that constant use by players causes the grass to be compacted, and the roots cannot develop as they should. Our green was closed on Friday morning, August 18th, for “Terrain Aeration”, which is a method of injecting compressed air at two levels - 6 inches and 12 inches below the surface, breaking up the compacted root system. As this does not affect the playing surface, apart from rows of small holes, play can resume almost immediately after treatment, and is therefore ideal for application at any time of the year. The work was carried out by Andy Butler Sports Ground Mainenance, our professional greenkeeper. On Wednesday evening, July 12th, over 30 regulars from the “Crab” - mixed with the Club members - played as “Crabs” v. “Lobsters” on six rinks. The “Crabs” won a very close game by 92 shots to 84 with their winning rink of Sheila, Mark, Rose & Shaun. The “Spider” was won by Carol Wyatt, and the “Cup”, provided by the Crab & Lobster, was presented to Nick Weedon, the captain of the “Crabs”. Brother, Simon, was Captain of the “Lobsters”. Many thanks to everyone who took part, and who helped to make this a successful evening in every way. It is hoped that this will become an annual event in our calendar. On Sunday, August 16th, our Annual friendly game against the Ventnor Royal British Legion took place at Mitchell Avenue, playing for the “BARRY CROAD MEMORIAL SHIELD”. 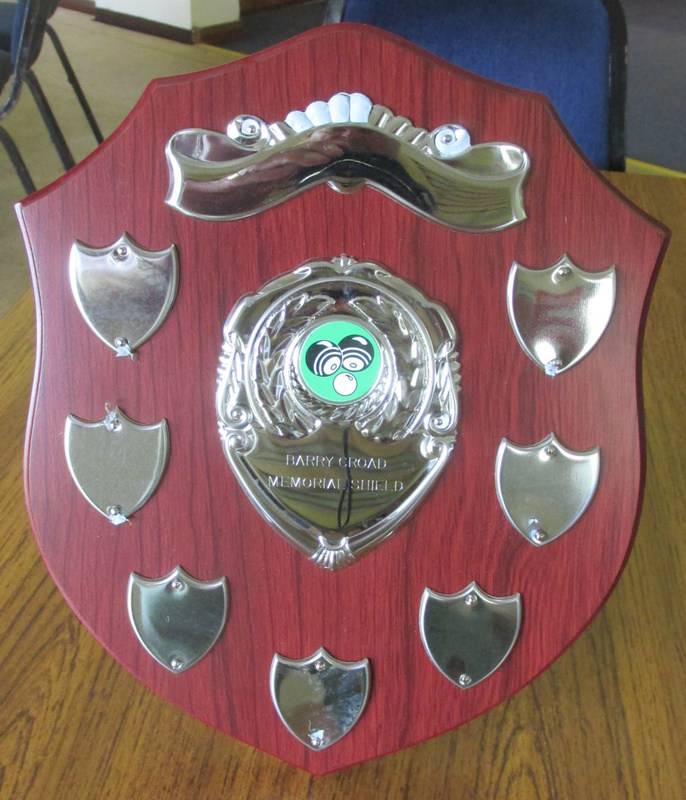 This magnificent trophy was presented by the Legion a few years ago - to be competed for each year, in memory of Barry Croad – a former member of the Bowling Club and the Legion. This is third time that the new Trophy has been contested, with the Bowling Club winning it for the third year running. This year the game was played as “Triples” (three-a-side) and resulted in a narrow win for the Bowling Club. 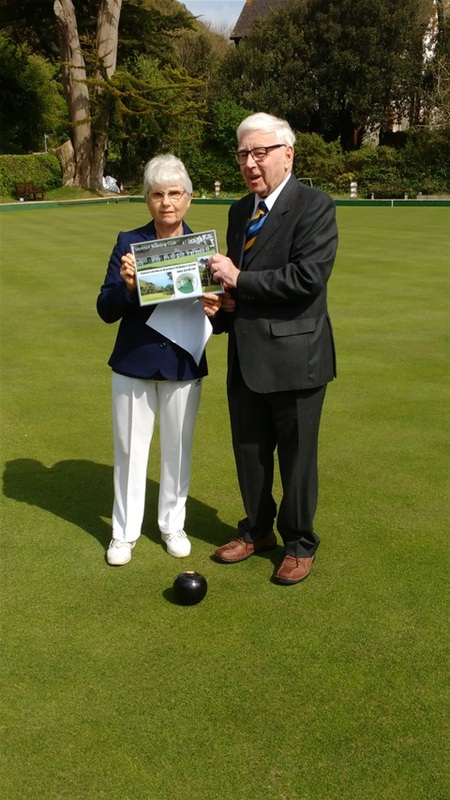 The top winning rink for the Legion was Rita, John A & George K., and for the Bowling Club it was Mark, Angela W. & Richard. The traditional return match (of Petanque, of course) will take place, at the Legion, later in the Summer on a date to be arranged. Thanks must go to the Bowling Club Captain, John Milmoe, who ably organized the afternoon. As always, the match score was insignificant, as the real winners were everyone who took part. The Club’s only life-member, 89-year-old Derek (Del) Pullan, accompanied by his wife, performed the opening ceremony of the outdoor green last Sunday. The morning started warm and sunny, but during the afternoon the cold wind began to make itself felt, to such an extent that it was decided to retreat into the clubhouse and partake of the tea and cakes a little earlier than planned. Play started with the traditional “Spider” which was won by Jenny Robbins. The winner of the spoon drive was Richard Wyatt (with an unbeatable score!) and the runner-up, for the second year running, was Susan Heaton-Watts who was presented with a “wooden spoon” which looked remarkably like an Easter Egg! 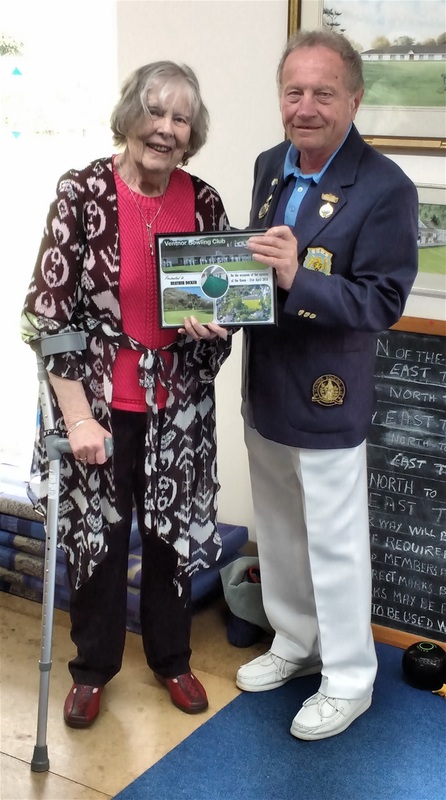 Club Captain, John Milmoe, organised the match play and after tea, Ventnor Club President Liz Pearce presented awards to the winners and runners-ups and thanked all those who had made the day a success especially those who had provided and prepared the food. Liz also welcomed two new members, Angie Heath and Kate Bryan, and thanked all those whose hard work had ensured that the clubhouse and surroundings were in pristine condition - as it always is for opening day. Grateful thank must go to maintenance manager, DEREK VENIER ably supported by BILL BEST, IAN CHEWTER, JOHN MILMOE, GEOFF HOLMES, DAVID STEAD, ROGER SMITH, TONY MORGAN, WAYNE McCLURE, MAURICE KANE and COLIN BEAVIS – not forgetting PHIL PEARCE, who made the drinks and supplied the doughnuts AND lots of advice! OUR BRAND NEW INDOOR CARPET is now in use after having been supplied and professionally fitted by a team from DALES SPORTS SURFACES Ltd, from Boston, Lincolnshire, over a couple of days last week. The previous Monday, the usual September task of lifting the boards was excellently handled by the dedicated volunteers, guided by Geoff Holmes (in Derek Venier’s absence). 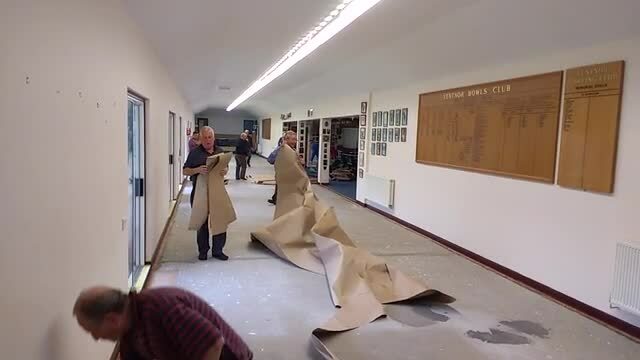 Due to the pending arrival of the new carpet and underlay, etc., EVERYTHING had to be removed this time – not just the boards – to give the contractors a completely clear space in which to work. Well done Geoff and team. (The transformation of the Clubhouse from summer mode to winter mode does not “just happen”. A small band of volunteers make this annual task appear quick and simple, and the club is grateful to them for their sterling efforts twice a year. (don’t forget, it has to be done all over again, in reverse, in the Spring). 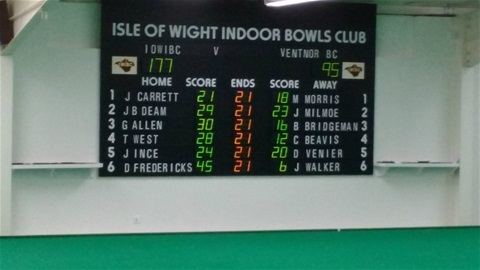 Twenty-four Ventnor players took part in a six-rink friendly against the Isle of Wight Indoor Bowls Club at their superb facility at Westridge, Ryde. 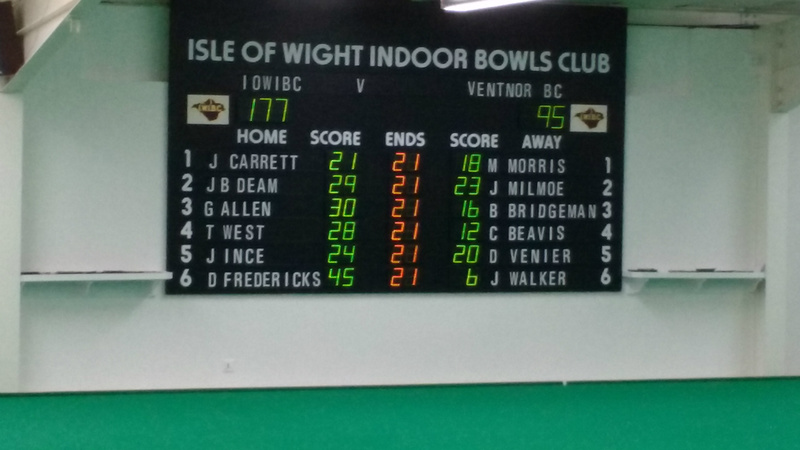 Again, this year, Ventnor lost on all six rinks, with a final score of 177 to the IWIBC and 95 to Ventnor BC. (which was an improvement on last year, when we lost by exactly 100 shots!). The "Best" losing rink was Ian Saunders, Wayne McClure, Phil Pearce and Mark Morris, who were ahead with just two ends to go but finally went down by three shots. Despite the overall scoreline, a very enjoyable time was had by all who took part. After the game, all the players enjoyed a Roast Dinner during which the IWIBC Captain-of-the-day, Jeremy Baker-Deam, welcomed the visitors. Ventnor President, Liz Pearce, thanked the hosts for their hospitality and their efforts to make the afternoon a success. Nearly fifty members, their famiies and friends sat down to a two-course meal, followed by carols and festive songs (and plenty of drinks). 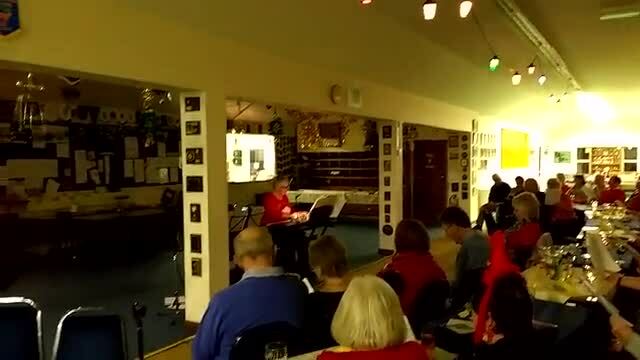 The excellent musical accompaniment was provided by Club members Jenny Robbins on keyboard and Sid Lines on guitar. The evening concluded with the draw for the magnificent Christmas Hamper (ALL provided by members) which was won by Vicky Stead. There were four other consolation prize–winners, Barry Simpson, Judy Anderson, John Milmoe and Judy Saunders. Thanks must go to our own Christmas Carol (Venier) and Derek, for all the hard work they put in to make this the success that it undoubtedly was. We will have to do it again next year! View of new kitchen looking South, away from the outside door. The refurbishment of the Club's kitchen is now complete. 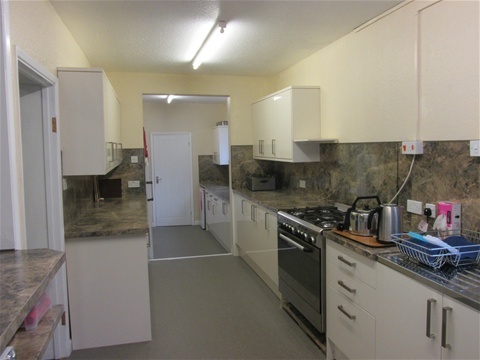 Apart from the white goods (fridges, freezers, microwave and water heaters, etc.) and the trusty old gas cooker, all the units and worksurfaces are brand new. Although various members contributed in small ways, all of the fitting work was undertaken by two members - DEREK VENIER and ROGER SMITH - who dedicated hours and hours of their free time. EVERYONE at the Club is in their debt for their fantastic effort. 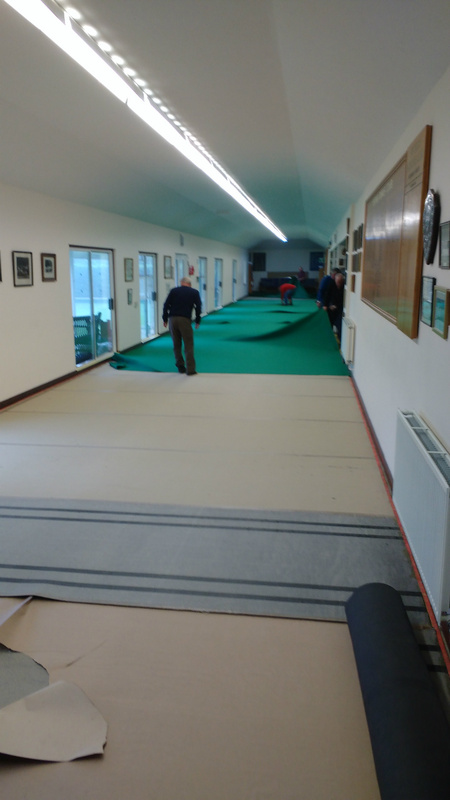 We also have a new vinyl floor to complete the re-fit and we are indebted to "a club member" who donated the cost of this floor to the club but wishes to remain anonymous.